« Who IS, What IS, EVIL? What Is Causality? What is an Explanation? Pondering the nature of the concept of explanation is the first step in thinking. So you may say that there is nothing more important, nothing more human. Mathematics, logic, physics, and the rest of science give a strict definition of what causality, and an explanation is. Through systems of axioms and theorems. Some of the sub-systems therein have to do with logic (“Predicate Calculus”). They are found all over science and common sense (although they will not be necessarily present in systems of thought such as, say, poetry, or rhetoric). WHEN A IMPLIES B, IN A LOGOS, ONE OUGHT TO SAY THAT A “CAUSES” B. A and B are propositions. They do not have to be very precise. Precision Is Not Necessarily The Smartest. Semantic Web Necessary. As it turns out, except in Classical Computer Science as it exists today (Classical CS by opposition to Quantum CS, a subject developing in the last 20 years), propositions are never precise (so a degree of poetry is everywhere, even in mathematics!) Propositions, in practice, depend upon a semantic web. A could be: “Plate Tectonic” and B could be “Continental Drift”. That A causes B is one of axioms of present day geophysics. Thus I define causality as logical implication. To use David Hume’s example: flame F brings heat H, always, and so is supposed to cause it: F implies H. Hume deduced causality from observation of the link (if…then). More detailed modern physics shows that the heat of flame F is agitation that can be transmitted (both a theorem about, and a definition of, heat). Now we have a full, detailed logos about F and what H means, and how F implies H, down to electronic orbitals. Mathematicians are used to make elaborate demonstrations, and then, to their horror, discover somewhere something that cannot be causally justified. Then they have to reconsider from scratch. Mathematics is all about causality. “Causes” in mathematics are also called axioms. In practice, well known theorems are used as axioms to implement further mathematical causality. A mathematician using a theorem from a distant field may not be aware of all the subtleties that allow to prove it: he would use distant theorems he does no know the proof of, as axioms. Some mathematician’s, or logician’s axiom is another’s theorem. Causality, by the way, reflects the axonal geometry of the brain. The full logic of the brain is much more complicated than mathematics, let alone Classical Computer Science, have it. Indeed, brain logic involves much more than axons, such as dendrites, neurotransmitters, glial cells, etc. And of these, only axonal geometry is simple enough to be approximated by classical logic… In first order. Mathematics is causation. And the ultimate explanation. Mathematics makes causation as limpid we can have it. I pointed out later to Philip that Classical Programming was insufficient to embrace full human (and quantum!) logic. He agreed. Massimo: It most obviously isn’t. What’s causal about Fermat’s Last Theorem? Causality implies physicality, and most of pure math has absolutely nothing whatsoever to do with physicality. Insults are fundamentally poetic, illogical, or pre-logical. Massimo is saying that been totally confused about causality and explanations is a sacred cow of a whole class of philosophers (to whom he had decided he belongs). 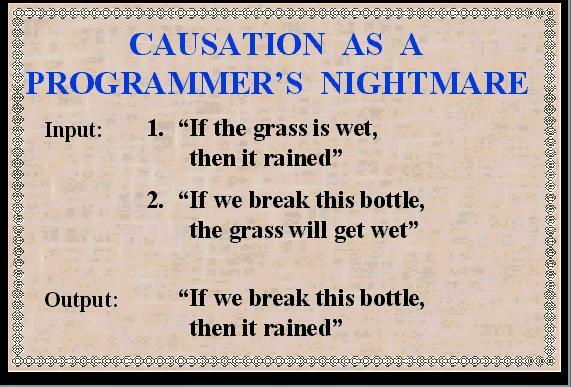 Being confused about causality started way back. Russell was as wrong as wrong could be (not about the monarchy, but about “causation”). He wrote the preceding in 1913, when Relativity was well implanted, and he, like many others, was no doubt unnerved by it. Poincare’ noticed, while founding officially “Relativity” in 1904, that apparent succession of events was not absolute (but depended upon relative motions). But, temporal succession is only an indication of possible causality. In truth causality exists, if, and only if, a logical system establishes it (moreover, said logic has to be “true”; that, assigning a truth value, is, by itself is a separate question that great logicians have studied without clear conclusions). When an explanation can be fully mathematized, it is finished. Far from being “abstract”, it has become trivial, or so suppose those with minds for whom mathematics is obvious. Mathematics is just like 2 + 2 = 4, written very large. To brandish mathematics as unfathomable “abstract” sorcery, as was done in Scientia Salon, is a strange, but not new, streak. My answer is that mathematical, and, more generally logical, explanations are the model of all explanations. We speak (logos) and thus we communicate our thoughts. Even to ourselves. The difference between mathematics and logic? Mathematics is more poetical. For example, Category Theory is not anchored in logic, nor anywhere else. It is hanging out there, beautiful and useful, a castle in the sky, just like all and any poem. Such ought to be the set-up on the nature of what causality could be, to figure out what causality is in the physical world. Considering that Quantum Entanglement is all over nature, this is not going to be easy (and it may contain a hidden clock). This entry was posted on March 29, 2015 at 10:34 pm and is filed under Category Theory, Mathematics, Systems Of Moods, Systems Of Thought. You can follow any responses to this entry through the RSS 2.0 feed. You can leave a response, or trackback from your own site. Dear Patrice, What Poincare noticed was that it appeared that the order of events depended on the relative motion of the observers, but that does not mean there was not an absolute order. It seems to me that there dis a range as in quantum mechanics of believing that what one observes is, as opposed to what one observes has to be corrected for additional phenomena, such as relative motion. Yes the order of events in two uniformly moving frames fixed relative each other depended upon the direction of a third moving frame where the observer is located. Poincare’ observed. Having an absolute order could still be found indeed, as you say, because of another Poincare’ invention, slow synchronicity of clocks. My computer “correcting” typos and my having to rush to the phone and sending without checking did tend to make part of it somewhat lacking in comprehension. Sorry. No, my thought was that thanks to Bohr et al, some seem to believe that it is the act of observation that generates the event, which in my view is nonsense, especially for the events Poincare was discussing. And yes, Einstein was not exactly liberal with his list of references, seeming to believe the empty set was adequate. Strangely, Einstein boasted about it. I gave a more detailed comment to the measurement problem. Funny how this professional philosopher, Massimo, got upset and condescending (I went on SS). Probably sheer jealousy. The problem is that the “wavefunction” depends upon the possible outcomes of the experiment (“eigenstates”). Experiments vary according to observers (Einstein-Schrodinger cat). The “photon trajectories” you mentioned in the past make “weak measurements” (plus assumptions about what they want to “prove”). The only solution to the “Cat” problem is the absolute Quantum Wave I propose. I think we should agree to disagree over the wave function. My interpretation is there is a physical wave that causes the diffraction, and the wave is causal (as if the Schrodinger equation; if you know what ψ is now, you know it for any change of conditions). Now there is no cat paradox at all, and all observers do is to record what happens. I say this just to argue that your proposal is not the only one. I don’t think we are not saying the same thing. We just observed that the CI wavefunction was observer dependent, and that both irk us. By the ultrafilter trick, I go down to the appropriate observer (in this case, the cat)… and the appropriate wavefunction then is the real wave, observer independent.